If you want to lead an environmentally sustainable lifestyle you will need to consider your shopping choices, beyond buying locally produced organic food (see related article). Buying sustainable, farmed food is a major aspect of shopping for a better world, which can provide the basis for a wider 'ethical' food and goods shopping strategy. If you are shopping for sustainability it follows that you will be shopping for ethically produced goods. Ethical goods are defined as those that do not harm the environment, and which also come from sources where the workers involved in the production of those products are treated fairly and paid reasonably. If you are buying locally sustainable food, it will be in all likelihood ethically produced; we have extensive laws in place to ensure that employees are managed humanely. However, in many countries employees are forced to work long hours for very low pay. It recently emerged that 'AppleMac' manufacture their 'i-pods' in Longhua, China, where workers are paid as little as £27 per month for 15 hour working days. It must be borne in mind that in addition to this, China are not subject to the same carbon emissions restrictions as Europe and the developing world. In fact, they are the only country other than the U.S. and Australia that have not signed up to the Kyoto Protocol on Climate Change, and have less self imposed restrictions than either. It is invariably the case that items manufactured under 'sweat shop' conditions are manufactured in developing countries that are not subject to the same legal obligations to reduce carbon emissions as industrialised 'Annex I' countries. Given this, it can be surmised that there is a direct link between ethical shopping and sustainable shopping for those goods that you cannot buy locally. Ethical shopping will depend on a range of factors that will ultimately be up to the individual to decide. 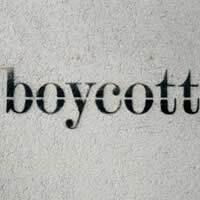 There are cases for the boycotting of many goods on many different bases. Whilst you may feel that the unethical methods employed by Adidas to kill kangaroos used for some of there footwear makes you want to give them a wide berth, whether or not one should boycott the produce of an entire nation (such as Israel, under the 'Boycott Israel' campaign) in response to their foreign policy is a trickier subject. You may well even surmise that such a policy would, logically, also entail the boycotting of U.S. and U.K. goods on the basis of the ongoing military campaign in Iraq! It is worth bearing in mind the huge human and environmental toll warfare and military conflict takes. What you deem to be an ethical war and what is not, is a subject for your own consideration. According to a sustainable shopping policy, it may well be best to stick as far as possible to goods that are either: I) locally produced, or failing that; II) produced by an ethically sound company, from a country with an ethically sound foreign and domestic policy. When you have considered your stance you can start with a list of everything you need to buy, and then break the list into what can be bought locally, and what cannot. Now, with the list that can be bought locally, it is necessary to focus on buying sustainable goods so far as possible and avoiding goods that damage the environment and are imported from distant countries (see related articles on food shopping, supermarket shopping and energy efficient appliances). Following this, take the list of things that cannot be bought from local sources and apply your own ethical stance to it. With a little research it will be possible to get everything you need from sustainable, ethical sources. Esso fail to admit the damage that carbon emissions do to the environment, and are held partly responsible for Americas refusal to sign the Kyoto Protocol on Climate Change, through their financial backing of Republican policy. KFC fell trees in the Amazon to make space to grow and harvest soya. Nike employ workers in appalling conditions in sweat shops in Asia and South America. Shell Oil has an appalling policy on climate change, also failing to acknowledge the role of carbon emissions in our environmental decline. Shell are also responsible for inhumane (literally murderous) and environmentally damaging policies carried out in the pursuit of oil in Nigeria. Reams of similar stories, coming from large, well known companies can be easily found through an internet search. The Good Shopping Guide logo can be applied to any product and denotes an ethically sound production. The Fairtrade mark is awarded to independently assessed foods that are produced and distributed on a fair basis between companies, consumers and employees. The Rugmark guarantees that a product has not been produced using child labour.